Apple's new iOS upgrade brings with it a lot of new features. Using iOS 8-ready apps, such as SwiftKey, is a good way to familiarize yourself with some of the software's latest enhancements. For Android folks, the idea of third-party keyboards is ancient news. If you’re an iOS loyalist, especially one who’s tired of Apple’s not-so-helpful autocorrect feature, the arrival of keyboard choices in iOS 8 feels worthy of a ticker tape parade. Released Wednesday, iOS 8 offers lots of new features without drastically changing the look and feel of the software. A great way to start exploring the features is by downloading or updating apps that utilize new functionality in iOS 8. Here are five to get you started. Well known to Android users, SwiftKey is a free iPhone/iPad app that provides a nice alternative to Apple’s default keyboard, which was also updated for iOS 8. The big deal here is the ability to type words by swiping your finger across the keyboard from one character to the next without stopping. The motion connects the characters into a string that forms the word you want. For example, if you want to type the word "quit," you start by touching the "q" character, then swing over (without lifting your finger) to "u," next "i," and finally, "t." During this process, possible words that match your character selections show up just above the keyboard. It takes some getting used to, but I suspect I’m going to use SwiftKey a lot. * Travel Guide by AFAR. 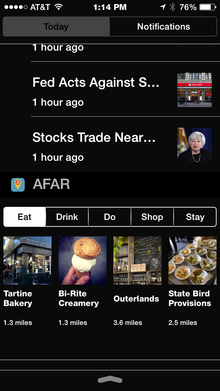 San Francisco-based AFAR magazine has a bit more bite and insight than glossier competitors such as Travel + Leisure. Its iOS app now puts a cool widget in your Today menu that's organized with five topical tabs: Eat, Drink, Do, Shop, and Stay. Each option has a thumbnail image accompanied by business name and distance from your current location. It’s a cool way to get quick recommendations. * OpenTable now displays upcoming reservations in the Today menu, which, when tapped, take you to the OpenTable app where you can quickly change or cancel a reservation or get directions to a restaurant. 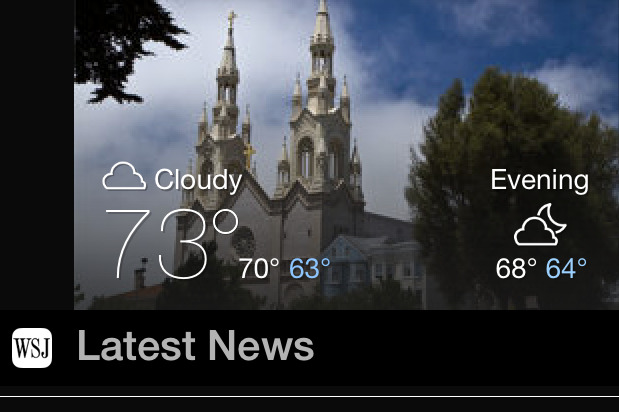 * Yahoo Weather conveniently displays a thumbnail image of current weather conditions for your geographic area along with current conditions, temperature information and a quick forecast.